Today, the value and function that people demand in a PWC are becoming increasingly sophisticated. People want high performance and advanced functions that are out of the ordinary, and styling that is the envy of everyone in the surrounding area. Of course, high reliability is a basic premise that goes without saying, and the importance of environmental performance and economic performance are on the rise. The new FX Cruiser High Output/FX High Output models represent the latest in PWC, acheiving a harmony of these elements at a very high level. The balance of a margin of power and economy with the large displacement 1.8L high output engine makes itself more apparent the longer you ride. The ultra lightweight NanoXcel body featuring both superior maneuverability and comfort represents another leading feature. This model is guaranteed to be celebrated far into the future. The combination of a high output engine, lightweight body and newly designed pump generate awesome acceleration. On the other hand, it can also be used for cruising or towing a wakeboard with power to spare. The only limit to enjoyment on the weekends with this model is your imagination. Potential of 1.8L NA Engine: The newly developed High Output Engine revs up in an exhilarating manner characteristic of a Naturally Aspirated (NA) engine. Enjoy the generous amount of power generated by the heartbeat of the engine that responds in a linear manner to the throttle. The jet pump has been painstakingly tuned to match it to the output characteristics of the engine. The large diametre 87mm pump nozzle directly converts the briskly revving characteristic of the high output engine into acceleration. The impeller and intake screen which have a considerable influence on performance have also been especially designed for this engine. The new engine and pump combine with the ultra lightweight NanoXcel body to achieve surprising acceleration. However, this aggressive character is only one aspect of this model. NA engines feature minimum power loss and good fuel economy. Using this as a base, the intake and exhaust systems, compression ratio and other parts of the engine have been tuned in order to achieve the ideal balance of cruising performance, environmental performance and economy. Filling up the 70L large fuel tank provides a day of fun. 5-Positions Quick Shift Trim System (QSTS): A handlebar-fitted adjuster operation makes it possible to adjust the trim of the pump over a 5-step range. It allows for bow up or down adjustment to suit the water condition for rider preference for better performance and comfort. This feature heightens the performance of this model both in sporty riding and as a cruiser model. Various Added Value Features for Fun on the Water: A number of electronic control functions further enhance the quality of the model as a cruiser. Cruise Assist maintains the engine RPM at the desired level, freeing the rider from continuous throttle work when cruising long distances. The No Wake Mode makes operation easier when going through areas where the speed limit is reduced to 8 kilometres per hour. And Reverse Traction Control controls engine RPM at the optimum pump efficiency when going backwards to maximise performance. All of these functions are sure to provide you with a secret sense of mastery when cruising with friends. The provision of watertight compartments and beverage holders on both sides of the steering column enable you to reliably access what you really want. The cockpit has an analog metre that allows the direct revving up of the NA engine to be visualised, and is sure to inspire the sportsman or sportswoman in you the moment you get on the machine. The A57D GPS-Chartplotter/Fishfinder is a powerful yet compact navigation system combined with our award winning HD Digital fishfinder technology. The A57D features a vibrant direct sunlight viewable high resolution 5.7” VGA colour display. The rugged waterproof construction make the A57D a perfect fit for centre consoles and open cockpits. 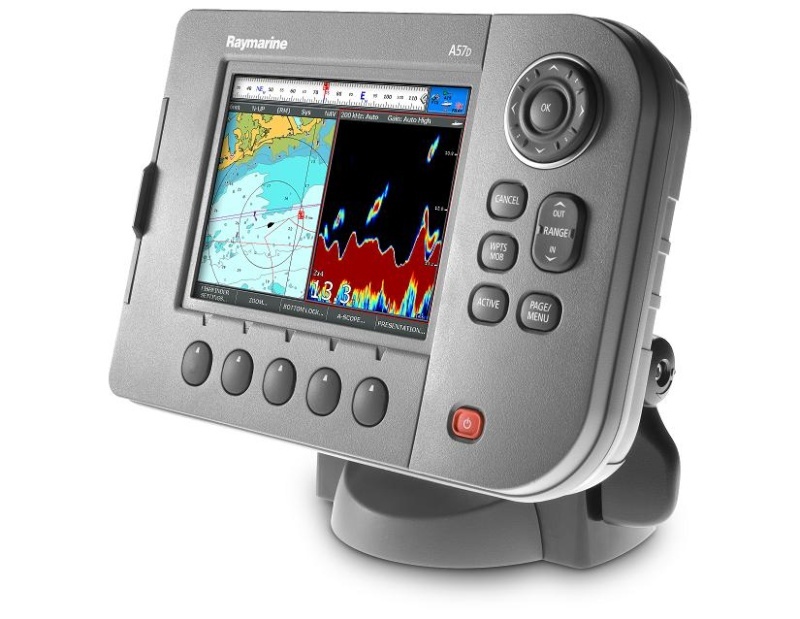 This A57D is preloaded with ready-to-navigate Navionics cartography that covers entire regions of Europe**. Expand your chartplotters capability by adding optional Navionics Gold or HotMaps charts using the onboard CompactFlash card reader. Or step up to Navionics Platinum for the ultimate chartplotting experience. Navionics Platinum charts feature 3D and satellite cartography, panoramic port photos, dynamic tides & currents, enhanced coastal points of interest, and more! Each A57D features a high sensitivity internal WAAS GPS receiver providing pinpoint chartplotter accuracy. For added flexibility add a RayStar 125 GPS antenna for situations where an external GPS antenna is needed. Harnessing the power of Raymarine’s HD Digital fishfinder technology, the A57D’s built-in digital sounder module offer unmatched fishfinder clarity and precision. Our patented HD Digital technology enables the A57D to instantly adapt to changing water and seabed conditions, delivering a dramatically clearer picture than ordinary analog fishfinders. Plus HD Digital technology enables true “hands-free” automatic operation, for an optimal fishfinder display at all times. Also enjoy full chartplotter integration, the A57D lets you mark fish targets or wrecks as waypoints. Easily switch screens back to the chartplotter and navigate right to your target! Simply plug in to the included transom mount transducer and you have the ultimate digital fishfinder. Using the same patented HD Digital technology as its big-brother DSM300, the A57D’s built-in sounder packs 500 watts RMS of power with a dual frequency (50/200 Khz) transceiver for excellent inshore and offshore performance. Directly compatible with the full array of A Series transducers, and adaptable to the DSM300 family of transducers*, a wide selection of styles are available to fit almost any boat including transom mounts, thru-hull mounts and in-hull solutions. The A57D comes with our innovative tilt and swivel bracket featuring a quick release lever. Once the A57D is off the boat keep your cables tidy and protected with the built-in cable management system and protective cable caps. A flush mount kit is also available for other helm applications. The A57D GPS-Chartplotter/Fishfinder comes packaged with a tilt & swivel bracket, suncover, power/NMEA cable, transom mount transducer, and instruction manual. The A57D is also SeaTalkNG capable allowing for engine monitoring with compatible engines. With SeaTalkNG you can even activate and control your Raymarine SPX Autopilot Series directly from the A57D’s chartplotter. *adapter cable required, sold separately. Preloaded cartography for Europe. Use optional Navionics Gold or Platinum charts. 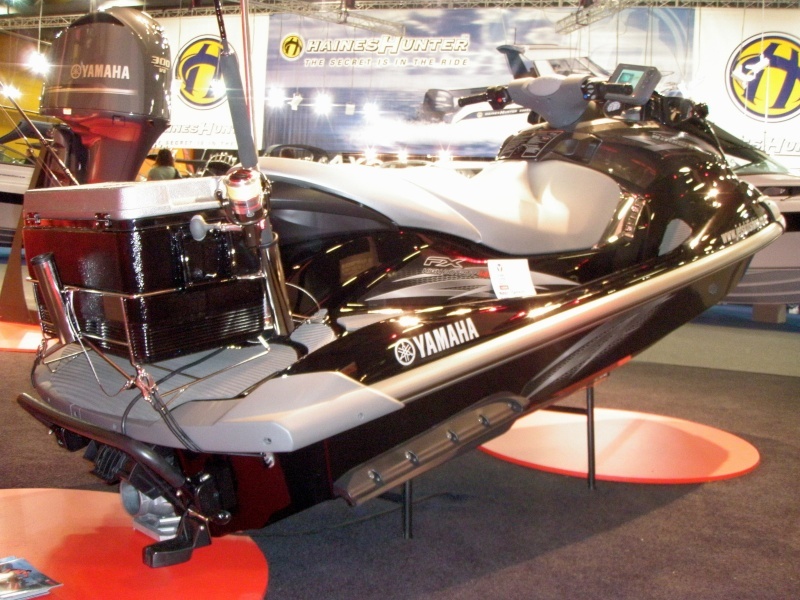 Hi, the Yamaha hull is what you could call, a composite hull with small air pockets which effect the performance of transducers mounted internally, hence the external mounting on the custom brackets available through jetskifishing. The Sea-Doo hulls are fibreglass, so we normally mount them internally on a eurathane pad and this does not effect the performance. I have read a little, enough to be dangerous, about their hulls, I get lighter and stronger but if it has air bubbles in the layup, that reminds me of 'chopper gun' type construction. "Yamaha hull is what you could call, a composite hull with small air pockets "
I understand the signal distortion air would make whether hull cavitation of hull anomally.